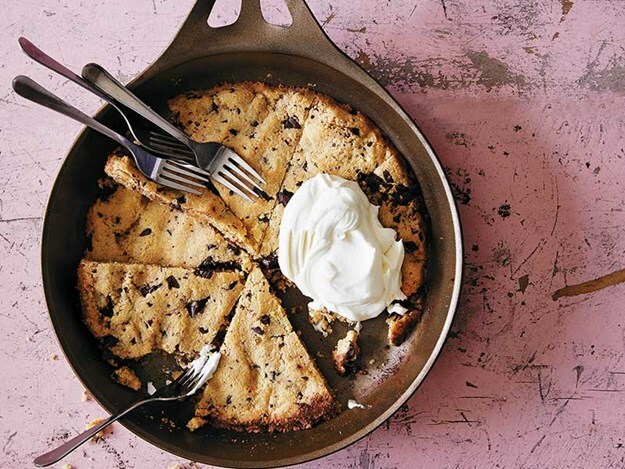 This choc-chip skillet cookies recipe from I Quit Sugar: Simplicious Flow by Sarah Wilson is completely sugar-free! Preheat the oven to 180°C (160°C fan-forced). Place a small skillet over low–medium heat. Add the butter, rice malt syrup and vanilla and stir until the butter melts. Remove from the heat and allow to cool slightly. Crack the egg into the skillet and lightly whisk with a fork to combine. Add the almond pulp or meal, baking powder and salt and stir to form a batter. Fold through the chocolate pieces. Flatten the mixture around the skillet with a spatula. Place in the oven and bake for 15 minutes, until very lightly browned on top. Slice and serve immediately with a dollop of cream.